This sounds interesting. Oh, and I changed my Gravatar ‘cuz Linda REALLLLLLY doesn’t like ‘Pukie’. I’m guessing she’s met him just one too many times. I like that pukie guy…he’s funny! This workout should be called “New Definition of Rest”- It is hard to even explain what this felt like. I couldn’t keep up with my reps at all. Every time Matt said “rest” your body wanted to rest but it isn’t really a “rest”- more like a torture rest. This one stripped me down- NOT TO MENTION the fact that Matt made me do the 45lb kb!! Tough, tough, tough………..that sums it up. Linda, I thoroughly enjoyed your music this morning. It was the only thing I had to smile about during this workout. Have a great weekend…………see ya Monday! Oh, that was diabolical Matt. Having something earlier in the week come up and bite us today. There was no “rest” & at times I think the “rest” was harder that the other thing we were doing (feet in the air after situps, electric chair). The group this morning was great. I lost count after my first 30 seconds. Saturday will be my last workout….as a young 44 yrs old. Do I get a pass and not have to workout on my b-day? Can I pick my own WOD? Those “do-nothings” sound good. See ya’ll on Saturday or hopefully our paths will cross sometime next week. Yes, this is meant to mess with your mind as well as your body. Simply put it is a test of will, this helps train the mind to push through the “little quits” that we pepper thoughout a workout to not get more than arms length from our comfort zone. The comfort zone is a cage; or even better, a tropical island. Your comfort zone is either a place to visit, a retreat to rest relax and recuperate for a period or a place to be stranded unable to leave. Everybody paddled way out in the water this morning; TREMENDOUS EFFORT today Silverbacks. 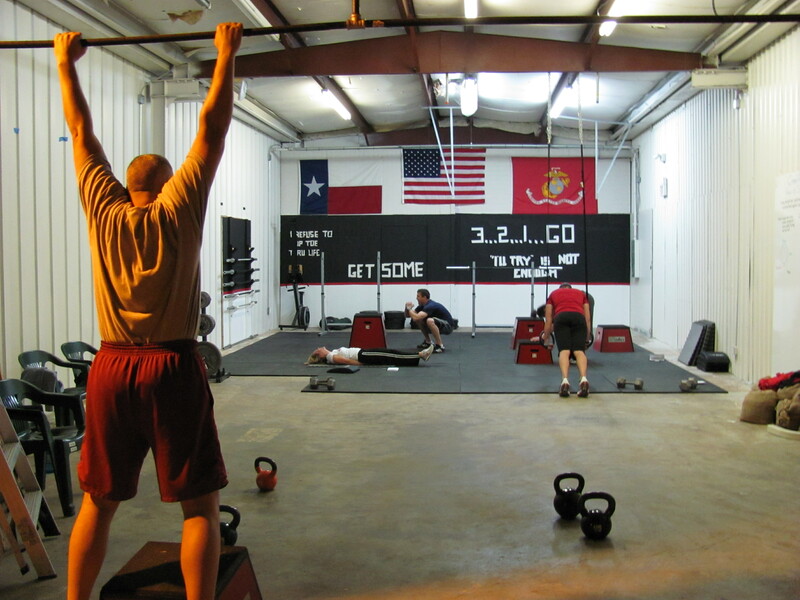 Matt – In addition to “test of will”, there are several other phrases that I would use to describe today’s wod but I’ll keep my profane comments to myself at this point. I agree with Linda and Casey — there was no “rest” in this at all, and attempting to keep track of the reps was beyond my mental faculties. Ok, I’ll stop my whining (for the moment). I will say this: After today’s workout, it made me realize how different crossfit is from anything I’ve done before. I rarely did anything that involved heavy use of the hips. Today’s program — with burpees, back squats, kettlebells, push presses, atomic situps and box jumps — wreaked havoc on my mine. Wow. I’m hurting already. Good luck to the p.m. crowd. Yeah!! My new gravatar is working 🙂 Tim and Brad you guys pushed me out of my comfort zone of my gravatar……I’m branching out! I am curious, what is an Atomic Sit Up? Keep working hard, it is worth it! Holy cow; those ‘electric chairs’ going into Box Jumps just KILLED me! I love this programming, today was my second PR in two weeks. Seperate strength component is DEFINITELY the way to go!